In the latest Berkeley controversy over what speakers may talk about, the progressive radio station KPFA has canceled an Aug. 9 on-stage appearance by the scientist Richard Dawkins. KPFA had invited the British scientist to discuss his newest book, Science in the Soul, which it termed “excellent.” But on Thursday it canceled the event, citing concerns about the tone of some of Dawkins’ tweets about Muslims. You conspicuously did not quote a source when accusing me of ‘abusive speech’. Why didn’t you check your facts – or at least have the common courtesy to alert me – before summarily cancelling my event? Seven days ago, writing in the Independent, novelist Rajeev Balasubramanyam – a Hindu name as it happens – weighed in against the renowned atheist. Click the image to read the full piece. 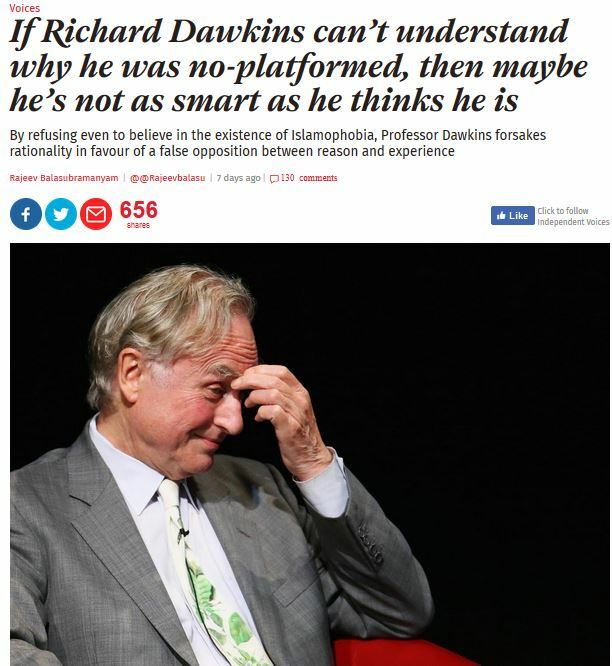 Despite the first of those two titles – he does court trouble with flashy headlines – Dawkins is not out to prove that God does not exist, if only because he knows full well he’d be on a hiding to nothing. Proving a negative is tough. This is a truth worth stating both for general reasons and in the context of criticisms made by a Rajeev Balasubramanyam who does flirt in singularly shallow fashion with epistemology. I disagree with Dawkins – and, for the same reason, with Steven Pinker and Sam Harris – on what I see as his idealist reductionism (which I used to share) in attributing violent Islamism to core tenets of Islam, as opposed to a century of post Ottoman colonialism and imperialism in the oil rich middle east. I agree with Balasubramanyam. Islamophobia is an important word, but it denotes a far trickier meme than he gives credit for. Its mirrored form is Islamism, repeatedly deployed by a western imperialism whose lead agents unblushingly declare total war on it. For a useful summary of a century of double-speak here, see Samir Amin’s Political Islam in the service of imperialism. … the way Dawkins speaks about Islamophobia, as a baseless, non-referential concept, is not dissimilar to the way he characterises god, or faith, as something that exists, “only in the form of a meme with high survival value or infective power, in the environment provided by human culture” (The Selfish Gene). He finds it intolerable that others should treat their subjective experience as evidentially valid, be these religious experiences or the “speaking as a woman” type of pronouncement often lumped together as “identity politics”, something Professor Dawkins has condemned as “one of the great evils of our age”. The trouble is that by invalidating experience, whether that of a group or an individual, as a basis for argument, Dawkins effectively invalidates most of the empirical tradition that he, as one of the self-styled guardians of the values of the enlightenment, lays claim to. Indeed, when it comes to the subject of Islam he has famously rejected the need even for textual evidence, tweeting that: “Of course you can have an opinion about Islam without having read the Qu’ran.” The necessary riposte to such statements is that Dawkins can get away with such opinions because of the tribe that he belongs to – that of white, upper-middle class, male super-intellectuals. The opening sentence of that last paragraph is a nonsense that hinges on Balasubramanyam’s failure – sly or sloppy? – to locate precisely where Dawkins refers to experience, thus robbing us of context. Are we to believe this first rate scientific mind unaware that the entire empirical tradition rests on the axiom – act of faith – that our senses are in principle capable of delivering accurate information about a real world ‘out there’? Are we to believe Dawkins is incapable of distinguishing subjective experience (Bernadette’s vision, say) from the shared and repeatable experience of seeing water consistently boiling, on 99.999 percent of our planet, at 100 degrees centigrade? I do not believe that Professor Dawkin’s blind spot regarding Islamophobia is due to casual insouciance or political naiveté, but to a combination of ignorance and intellectual arrogance that results directly from his own group identity, that of a hyper-advantaged white male, a modern day emperor of knowledge. Whereas I do, you see. I do believe Dawkins politically naive. (I’d further argue for naïveté as an important quality in science and other creative activities, but that’s another story.) He’s a naive scientist who should no more be taken seriously on Islam (as opposed to religious meddling on the teaching of science) than the naive rock star John Lennon on Christ – or the naive novelist Rajeev Balasubramanyam on Dawkins.